Home About Us | Services/Facility | Our Horses | News/Events | Riding Lessons | Festival Pictures | Directions | Contact Us! or during an opening or previous cancellation. Students must wear approved helmets and shoes with flat soles & heels. Students will have a claims release signed. Students will (learn to) groom and tack/untack their own horse. Students agree to pay cancellation fees: less than 4 days notice prior to a scheduled lesson, $10; less than 4 hours notice prior to a scheduled lesson, cost of the lesson. 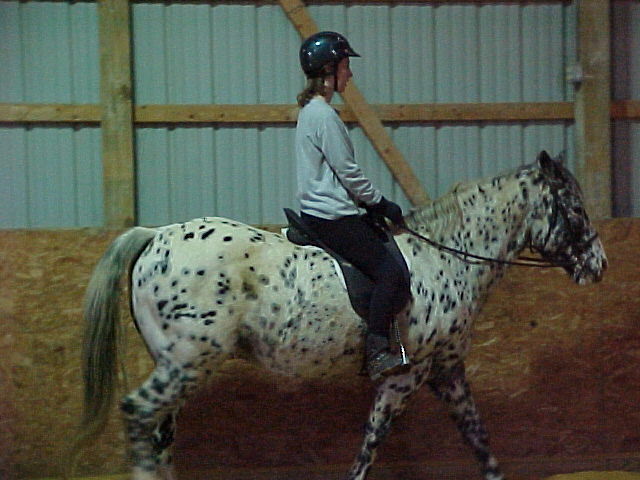 Sue has been riding since childhood and "training" horses since she was a teenager. While she now is more focused on dressage, she grew up riding western and competing in gymkannas and, at home, against her brother, Dan. They rode every day (unless one was sick). They did endurance before it was in vogue!! As an adult, her daughters wanted to ride "English". So lessons began and evolved into dressage lessons, a new concept in the States at that time, but the concept made more sense to Sue. Now, after teaching for over 15 years, Sue can help the beginner rider gain confidence and agility, the intermediate rider to understand aids and cues and the advanced rider to put it all together to show and achieve the horse's potential. Sue's students appreciate her "high tech." method of communicating so that they can always hear what she is saying. " I hated spending money on a lesson that I couldn't hear, or when the instructor would yell so loud, I would think he was mad at me!! ", she relates.